Man.. I have some messed up dreams. Most of the ones that I remember take place in the minutes between snooze button hitting in the morning, like today. The general theme of it that lasted quite a few rounds of snooze. Funny thing is though, to get to my alarm clock I have to get out of bed, otherwise I don't wake up at all. I've had to hide the alarm clock on important occaisons so that when it goes off I have to hunt for it in the morning and not just jump back in bed and go back to sleep. 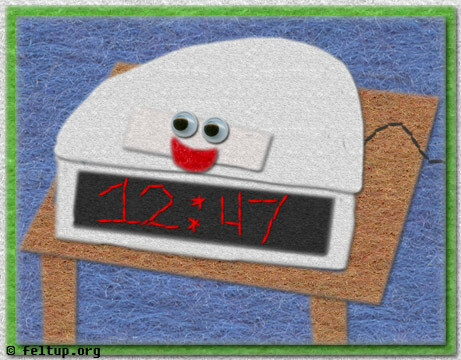 Anywho.. some how I managed to form the character of Suzie the Snooze Button in my mind.. can't really remember the origins of it, but it stuck. All this morning involved dreams of Suzie. She is my good friend, of course. She encourages me to do the things I enjoy, such as sleeping in. She even had a list of top 10 reasons to utilize Snooze. I can't really recall all of them, but #1 involved the fact that Suzie is a masochist and needs to be hit a lot.